May is the perfect time for a spring remodel. A great place to target is the basement bathroom. Although this space may be tight, there are a few tips that will help homeowners make the most in this area of their house without spending a fortune. 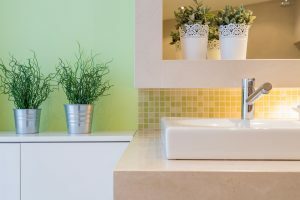 When you want a fabulous bathroom remodel, here are some ways to create a relaxing and enjoyable haven. Forget the Shower Curtain. Many designers are following the trend of open shower areas. Shower curtains and glass doors take up lots of space and make small areas seem even more enclosed. Since tubs are not usually part of basement bathrooms, these are the ideal places to incorporate this type of idea. Update with Moderate Fixtures. Updating the fixtures in your basement’s bathroom will give the space an instant facelift. However, it is not necessary to spend a fortune on high-end lighting or faucets to get a great effect. Expensive does not always mean better. There is a large number of less costly fixtures that are beautiful and do not break the bank. Lighten the Space. A basement can be a dark and dreary place. To add life to a bathroom in this part of the house, it is wise to paint the walls with a bright sateen or semi-gloss finish. This will reflect light and bring a luminosity to the room. A light color will give the illusion of more space as well. To present the appearance of a raised ceiling, this part of the room should be painted two shades lighter than the walls. If there is a window in the room, get rid of a heavy window treatment and replace it with wood blinds containing an earthy texture. This offers privacy yet allows light to penetrate the space. Accessories are Everything. If you do not have a ton of money to remodel your basement bathroom, an inexpensive upgrade can be your accessories in the space. Throw away your old bath linens and add fluffy towels that create a spa-like atmosphere. To finish this space in style, pair these items with a new mat and rugs. When you are ready for a bathroom remodel, turn to Columbus Bath Design by Luxury Bath for assistance. These experts offer a wide variety of shower options and tile possibilities. Your basement bathroom can be turned into a dream space at a fraction of the cost and time. For a free estimate, call (614)721-3879.